The image of the wide-eyed boy setting off to catch a great fish is a beguiling one, and a long roll of angling writers have tried to capture it. There is something about the fresh-faced innocence of a child fisherman that reaches so deeply into the angling psyche that it has set a thousand pens to paper; and no doubt will inspire a thousand more, long after you and I have hung up our rods for the last time. Neither are artists immune: prints of small boys equipped with the proverbial withy rod and bent pin are so ubiquitous that one hardly notices them any more. The one thing that the majority of the pictures and the stories have in common is that they set my teeth on edge. It takes a special talent to write a children’s book; and an even greater one to shape an evocation of a childhood past, without slipping into the twee vernacular that so temptingly beckons the writer. “BB” was in a unique position to fall into this trap, as a master at Rugby school, but he managed to dance just within the transition zone between artlessness and artificiality, and in the process he delivered a great book. “BB” wrote forty-five books in his lifetime, on a huge variety of sporting subjects, but fishing was his favourite. “The Whopper” pays homage to all the things he loved about the wood and the water. The great carp that lies at the centre of this tale serves as bait for the reader; because “The Whopper” isn’t about a long fight with a great fish; it is a call to take notice of the complex and puzzling world we live in. “Pickle Barrel,” as Tigger and Hoppy call him, serves as a mirror for our society, the environment, childhood aspirations, and all the unwritten rules of angling. Quite how well “BB” gets away with this is a measure of his stature as a sporting writer, because this is a book that one could hand equally well to an adult or a child. The passage of forty years has dated the characters a little, but they remain quite real, and the story carries them effortlessly in its flow. A adult will guess the ending and read this book as a classic, a child will enjoy it as a timeless tale and pull with Tigger as he fights the unstoppable rushes of the unseen fish in the small hours of the autumn night. There is, as it happens, another dimension to this edition of “The Whopper.” It is, in my opinion, a particularly satisfying book, with crisp pages and a rather nice smell about it. In this respect, its personality is nothing like Tigger’s, but I do think the two make rather a good match. 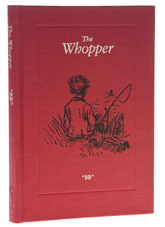 The UK first edition of The Whopper is the most expensive of all BB's books and extremely sought after by collectors.